Melanie Cressman and Maurice Rollins address the crowd at Wednesday’s announcement. BELLEVILLE – The Belleville Senators and the United Way are teaming up to reduce poverty in the Hasting and Prince Edward regions. The Sens and the United Way announced “The Face Off Against Poverty” challenge at a media event Wednesday morning. The challenge will see donors who give $1,200 or more will face off against the Sens in an exhibition game in the new year. Specific details surrounding the game are still being sorted out. The United Way says it hopes to get at least 25 people to donate that much. “If we could organize a fun activity for after the new year with new leaders, it might just be different enough that people would jump on board,” said Melanie Cressman, director of fundraising for the United Way of Hastings and Prince Edward. The Senators also announced that they would be donating $10,000 to the United Way. Rob Mullowney, the chief operating officer of the Belleville Senators, said it was important to the organization that they know where the money they donate is going. “In this case, with this group, the money stays here in our community,” he said. “We’ve said publicly that our actions speak louder than words, and so we want to be supporting our community, and we are proud to do that,” said Mullowney. Also on hand at Wednesday’s announcement was local businessman Maurice Rollins. Since 2008, he’s been the face of the Maurice Rollins Leadership Challenge Fund. For every $1,200 donation to the United Way, Rollins will match donations dollar for dollar. Rollins has also committed to match any increase of 10% or more by existing donors. 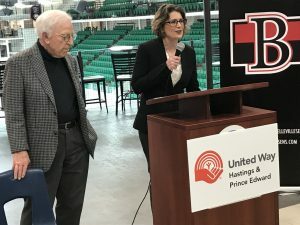 Cressman also said that proceeds from the B-Sens 50/50 draw at their December home games will also be donated to the United Way. The 50/50 draws offer half of ticket sales as a prize, while the other half is donated to charity.